The story follows the girls of the Pretty Four; Miku, Ginko, Sayaka, and Nana, as they face off against the current champions, Team Sapphire. With a burnt out drunk named Eiichi Suo for a coach the girls must not only contend with problems in the arena but also unforseen circumstances that arise in day to day life. Only through protecting their friends, understanding their enemies, and eventually challenging their idol Aquamarine, can Miku and the girls understand Eiichi's purpose and the shady secrets behind Neo Wrestling. What do you get if you take elements from "Pro Wrestling, Power Rangers and Angelic Layer", mix them in a blender and crank it up to high? Well aside from having a broken blender on your hands, the combination would most likely make "Metal Fighter Miku". Taking place in the near future, wrestling is not what it use to be. Gone are the days where two opponents would get in the ring, and fight each other hand to hand until the other was pinned. In this era fighters have now dawned metal suits, which strengthens their moves ten times over, thus calling it "Neo Wrestling!" Going into this anime, I was kind of expecting the whole "wrestling idea" to play more of a side story, thus making the anime feel gimmicky. But no, in truth it actually concentrates on the wrestling theme quite a bit...maybe even too much! So what you see is what you get, the anime follows this formula to a T. In center stage we have little Miku, star of the all female fighting team called the Pretty Four. The main bulk of the story follows the girls as they take on opponents (which usually happens at the end of most episodes) until they can make it to the top, all along meeting new friends and fierce rivals. What makes the anime fun is it’s mix of funny bits, drama and action. It doesn’t surpass anything while it does this, but is there none the less. Determination and team work plays key into each fight, as matches take place in a "four on four" tag match. Now because of the metal suits involved, don’t expect to see much in the way of authentic looking wrestling moves. Most of them are exaggerated, what with super jumps, power punches and the like (if you have ever seen Angelic Layer, then they look something like that). There are a few plot twists that take place near the end that can be quite unexpected too. Most opponents don’t play fair in the very least, and you will see quite a bit of cheating and underhanded deals going though. The main characters transform into their metal suits much like you would see in your tradition magical girl anime. While the story does remain very strait forward with it’’s idea, it also doesn’t do it in a repetitive manner either. As each episode spotlights a new problem for the team to over come, whether it be stopping the underhanded deeds done by their enemies, to simply encouraging one another to stay strong. There is little to no romance in this, and the ones that are present are handled very lightly. One of the problems I had with this anime, is with it’s actual ending. Which takes place in a "1 on 1" match, which I found to be odd since the overall anime is centered on teamwork. As a whole, some viewers might find it’s linear wrestling plot to be too strict to the source to enjoy, but I think fans of action anime may want to check this out, as many of the fights are fun to watch. Metal Fighter Miku shouldn’t contain anything that viewers would find offensive. There is no blood in this, nor is there any fan service. Of course there is violence as far as wrestling goes, but it’s only done in a mildly over the top manner. Taking into consideration that this anime was made almost 19 years ago, it goes without saying that it doesn’t live up to anything by today’s standards. However for it’s time it really is a well detailed and colorful series. Fights are animated smoothly, with hardly any kind of re-hashed scenes used over and over again (battle suit transformations aside). Backgrounds are the only thing that don’t live up to the rest of the art, they can look quite simplistic and dull at times. If you have ever seen a series called "Cat Girl Nuku Nuku" then you will notice many resemblances between the two. Nice tracks play throughout the series, they feel quite dated, but still have catchy beats to them. The opening and ending tracks don’t feel quite as old however, both are pretty high up beat tunes that match well with the girls personalities. Both are sung by the same vocalist too. As far as the background tracks go there really isn’t much to say. They do their jobs for what is going on in the anime, but lack any kind of really memorable tunes, with the exception of the main track that plays when the girls are about to enter the ring. Good voice overs through out the series, though the dub version does leave a little to be desired. They are a mixed baggage. Most of them are well thought out and do have a "wrestler’s attitude" about them (a good thing). The character that ended up intrigued me the most was the coach--Eiichi. He was quite the hard individual to figure out at first, they don’t actually try to hide his past from the viewers, but they do hide enough of it to make most people tilt their head in interest when they see him. Miku has everything you would want in a leader. She doesn’t show boat, works hard at what she does, and always gives it here all. As the story progress you will find out that she does have her weakness that must be overcome, which is nice as far as character development goes. The other girls were a little more disappointing, they never really molded past their whole "teamwork" idea, and some such as Sayaka, you never get any really knowledge of at all. The rivals and enemies can suffer from the same thing, with the exception of a few of them, who actually do show their true selves to the audience later on. The characters who were important to the story were great, it's just a shame that some never got the attention they deserved. Despite it's strait forward plot, "Metal Fighter Miku" serves up just the right amount of action that should keep most viewers satisfied. Fun characters, interesting battles and a nice mix of wrestling and dialog are all part of this package. Because of it's linear storyline though, not all will be able to stay interested, and while it may be not pin any of the competition out there, it does put up a very good fight in the ring. 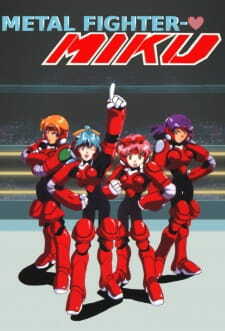 This anime was truly amazing when I watched it as a child. The beginning and ending songs were catchy, the characters were likable, etc. If you like animes that have the girl character that grows into some type of role, then you'll love this one. I came across this title by accident, but the concept sounded interesting, so I gave it a try and I did enjoy it. The story is straight forward. It's about a group of pro wrestlers by the name of The Pretty Four, who enter a tournament to be the best. The plot is easy to follow. The girls fight their opponents, and in some episodes face deeper dilemmas. It's nothing ground breaking, or complex, but it is entertaining, and something light to watch. There is one episode that strikes me as out there (I just didn't think it fit with the rest of the series), but the other twelve are good. The pacing is pretty fast. I would have liked a little more depth, and more build up, but that's just my personal tastes. I like that what little romance is present takes a back seat to the main story. There are a few hints that a character might like another, but it's never expanded upon. The only time that actually happens is used more for plot and character development. There is some decent characterization in this anime (not as good as some other titles, but decent). The title character Miku is likable. She is not perfect, nor is she annoying, and she has some character growth throughout the series. Ginko has some good character development, making her one of the more interesting cast members. However the other two of The Pretty Four -Nana and Sayaka- are pretty forgettable. Yoko serves a strong and respectable antagonist. Her father, however, comes across as two-dimensional-I still don't understand his motives. Still, the character I find to be the most developed of the bunch is the coach, Eiichi. I find him to have the greatest depth, an interesting backstory, and a believable personality. I found the art to be decent. It was standard for its time, but it may not hold up to the art of today's anime. I do like the use of color. The action scenes are fast-paced and fun to watch. The art is nothing spectacular, but it serves its purpose. The opening song is catchy. It's light-hearted and upbeat, perfectly matching the show itself. The ending song is also rather enjoyable. There is also a song that the girls sing (yes, they are singers in addition to wrestlers), and I think it's a cute song. The voice acting (at least with the English dub) is average for some characters and less than impressive with others. I wasn't blown away by voice talent with this one. I did enjoy this series. It is fun, it's easy to understand. For the most part, the main characters are likable. There is some good comedy thrown in to keep it from being a serious drama. There are plenty of cheesy moments as well, but I think that adds to its charm. Mostly, it kept my interest, and I was curious to find out what would happen next. I like the anime, and I'm glad that I stumbled upon it while looking for something else. There is action, drama, and a good bit of comedy. Some parts are corny, but in a good way. If you want something that is fun and easy to watch, I recommend this one.